This is a perceptive analysis of the problems and prospects that face Japan, America, and the world in which they interact. The Editors place the problem of Japanese/American relations in a global perspective and present several possible courses of action for the future. Each contributor then examines external policy issues, internal processes and images, economic issues, and technological and environmental issues from both nations’ viewpoints. Other topics considered include the policymaking processes, public opinion, the role of the military, cultural interrelationships, and the role of and importance of Southeast Asia. 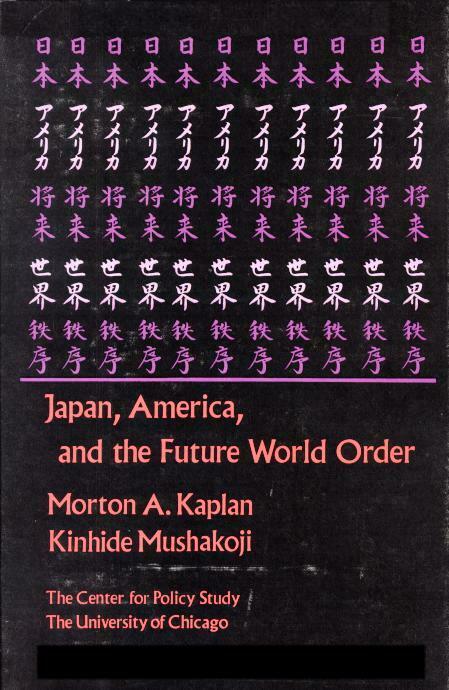 Japan, America, and the Future World Order also examines Sino-Japanese relations, particularly the economic relationship. One contributor looks at how the Chinese economic model functions, and its relevance to Japanese policy and to Japanese/American relations. Throughout the book the authors concentrate on the actual realities of Japanese/American relations. MORTON A. KAPLAN is Director of the Faculty Arms Control and Foreign Policy Seminar, Chairman of the Committee on International Relations, and Professor of Political Science at the University of Chicago. He is the author of many articles and books and has edited several publications of the Seminar. KINHIDE MUSHAKOJI is Professor of International Relations and Director of the Institute of International Relations at Sophia University in Tokyo. He has written several books.